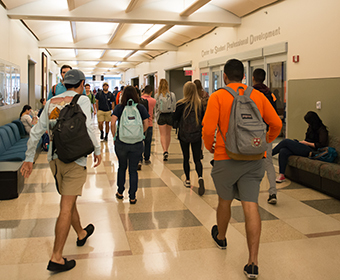 (Nov. 19, 2018) -- UTSA and the National Security Agency (NSA) have announced an articulation agreement to create accelerated degree plans in cybersecurity and modern languages and enhance workforce development in those fields. Bachelor of Arts in Modern Language Studies. The BBA in Cyber Security will be offered online; the BA in Spanish and BA in Modern Languages will be offered onsite at UTSA. The agreement will be formally signed by UTSA President Taylor Eighmy and Leonard Reinsfelder, commandant of the National Cryptologic School, in a ceremony at 2 p.m. on Monday, Nov. 26 in the Durango Building La Villita Room (DBB 1.116) at the UTSA Downtown Campus. "We are very proud of the Accelerated Degree Program and we want to make sure that our employees have the opportunity to further their education while also serving their country," he said. NSA had partnered with fewer than 10 higher education institutions to offer accelerated degrees for its employees. Others include Angelo State University, Augusta University, Capitol Technology University, Dakota State University, Drexel University, University of Maryland University College and University of West Florida. Nancy Martin, former associate vice provost for University College, will lead the project for UTSA. "NSA in Texas is excited to continue building our UTSA partnership,” said Col Gregory J. Gagnon, NSA in Texas Commander. “This agreement benefits both institutions and will be critical in developing the expertise of our workforce as they tackle some of America's toughest problems."